A must have shoe in your closet – Brogue! Brogue comes under the category of dress shoes. They are a symbol of style and class which gives you an undefined fashion look which you deserve. They are the most interesting shoe you can ever have. “Brogue” means perforation and these shoes are perforated in such a manner which tends to give an intricate design and style to your attire. Moreover, they somehow look similar to Oxfords. You can style Brogue with a suit or with formal pants. The majority of people prefer brogue shoes more than Oxfords or Derby. How to wear Brogues: the style of wearing brogue was considered an outdoor wear, however, in the early sixteen they were not accepted to wear in the formal occasions, but presently because of its many sub-styles they now have become a trend in the formal events. Because of its timeless appeal, it has become an important part of business attire too. Full Brogue or Wing Tip: one of the iconic style of brogue. This classic statement is identified by the pointed toe cap with extensions that goes along the both sides of the shoe. When viewed from the top, it looks like an “M” or “W” shape. Half Brogue: also known as semi-brogue they are distinguished by the top cap with the decorative detailing and serrations along the center and edges of the cap. They are more formal than full brogue. Quarter Brogue: when we talk about formal pick, then it would be justified to say that they are popular for work wear because of their decorative detailing at the edge. Thus, it can be suited as a dress shoe. Modern variations: one of the popular variations of brogues is the U-tip or U-cap, which is an ultimate adaptation of a “full” brogue. Every man should have at-least one pair of brogue shoe. 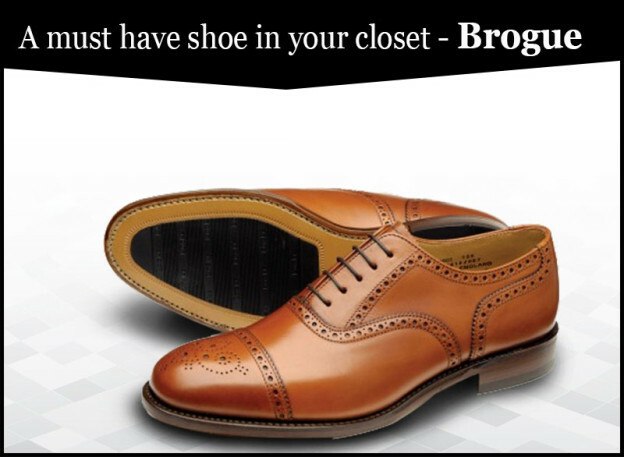 If versatility is what you live for, then without any doubt buy brogue. I hope they turn out to be your favorite out of many options.